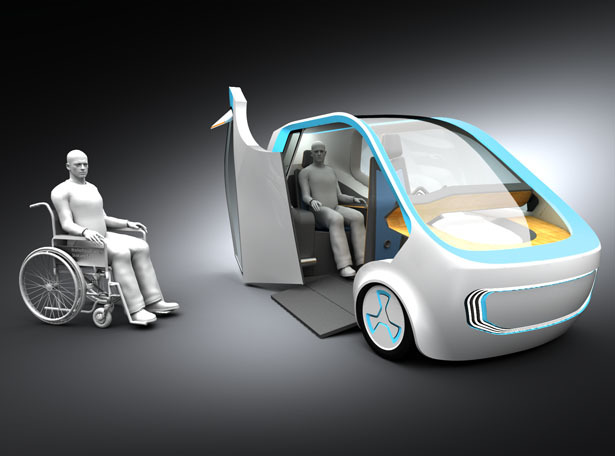 We have a dedicated research and development team that never stops creating customized manufacturing solutions for you. In fact, as a registered High-Tech Enterprise, we now have twenty-one manufacturing utility patents, with a further eight in development. 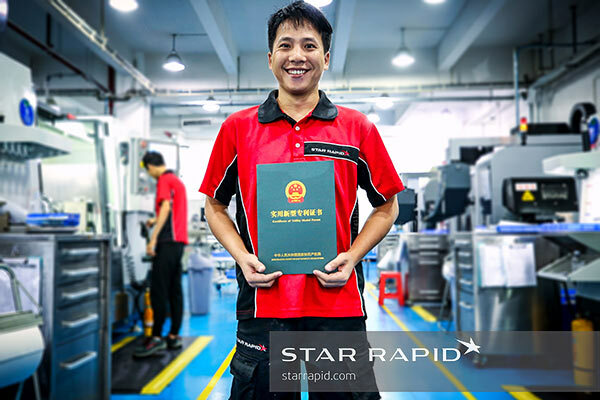 These patents demonstrate our commitment to constant improvement and customer satisfaction. Since we make more than a thousand new products every year, these are just a few examples of our machinists and engineers working together to design tools and fixtures that improve quality while saving you time and money. Holding thin-walled parts rigidly in a vise or fixture for CNC machining can be tricky because the parts have to resist a lot of pressure and torque but there may be little to hold on to. Sometimes such parts are temporarily glued to a sacrificial backing plate, which is time-consuming and inefficient. Is there a better and faster way? This is a pneumatic holding fixture. 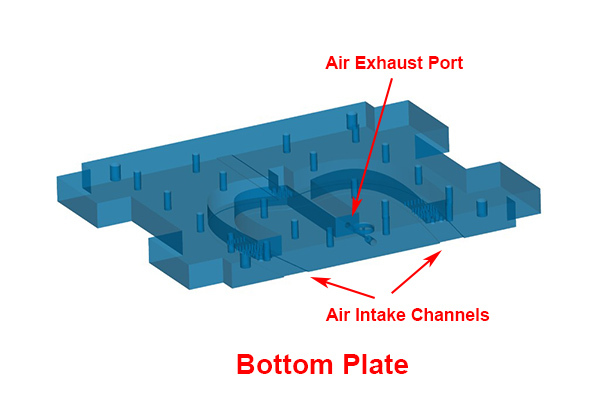 To make it work, an air tube was connected to a port in the bottom plate. 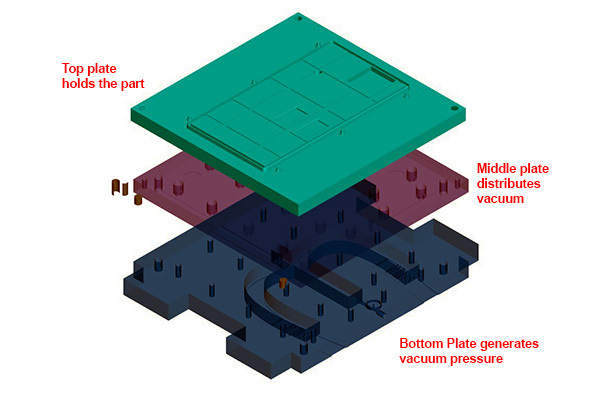 Under high vacuum pressure, air was pulled through an intricate series of channels located throughout the middle plate. This helped to distribute the negative pressure evenly. The top plate shows the external profile of the workpiece that was mounted there, in this example a mobile phone case machined from aluminum. Vacuum fixtures aren’t unusual, but we put the extra effort into making such fixtures even for just a few pieces, to ensure every part comes out perfectly. Cylindrical parts often need to have features machined around their circumference at precise angles, such as for rotors and gears. Sometimes this can be done using manually inserted locating pins mounted into a base plate. These help to control the rotation of the workpiece, but they also must be removed and reset with every machining operation, and that’s slow and cumbersome. Instead, we made an automatic indexing jig like this one. It uses pneumatic actuators to rotate the workpiece by a precise number of degrees to accurately machine the different faces. This entire assembly took a bit of engineering to put together, but the beauty of it is that it can be used for other projects in the future. We merely need to relocate the indexing blocks to support different degrees of rotation around whatever circular shape needs to be machined. In this example, we were challenged with milling the multi-sided panels of a soccer ball. The trick here is to ensure the finished features were uniform, with no overlaps, gaps or misalignments around the sphere. 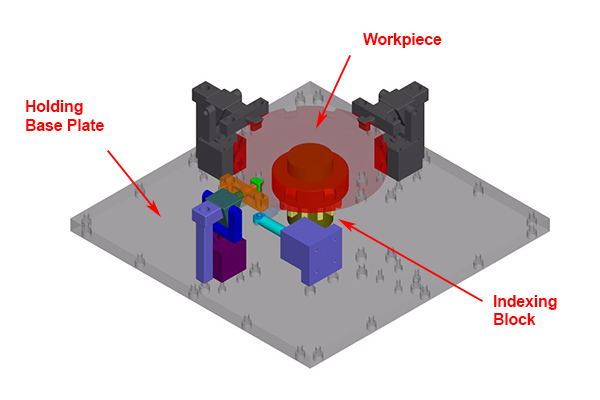 But how to hold the part securely around all 360°, without losing the alignment? We made this fixture to hold the sphere in the correct orientation while milling. We did this in a two-step process. First, a blank of raw material was partially roughed out to a hemisphere, but with the base of the sphere mounted on a hexagonal positioning block. This block held the ball while the top half was milled on our 5-axis CNC machine. 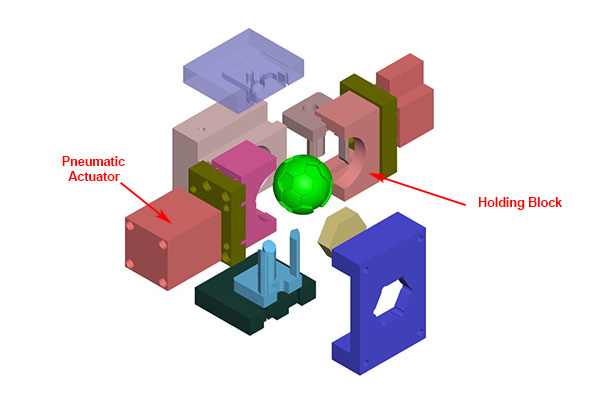 The 5-axis mill was ideal here because it’s capable of performing complex rotations around multiple axes without having to reposition the ball, which could potentially cause misalignment. Once the top of the ball was done, it was then flipped over, the holding fixture cut off, and the rest of the ball completed. 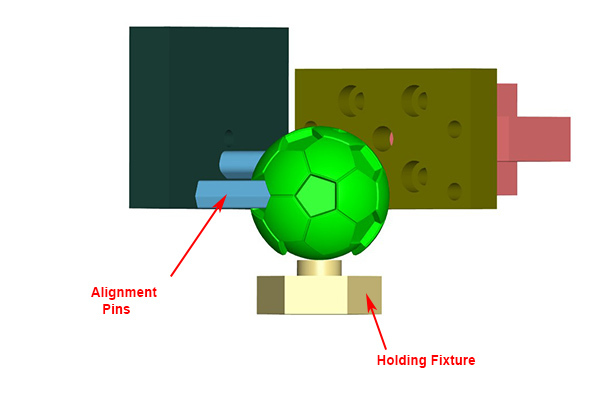 Since the positioning block was no longer available for orientation purposes, alignment pins were used to index the sphere according to the location of the previous pentagons. 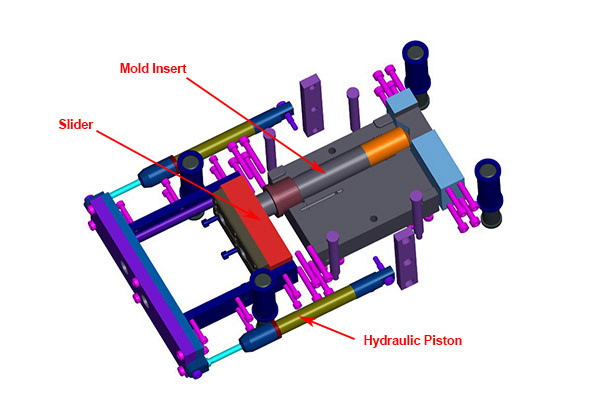 This mold was designed to make a long, thin-walled hollow plastic tube.During plastic injection molding, most parts are usually ejected from their cavities using ejector pins. But pins always leave witness marks, and in this case that was unacceptable to the customer. Also, ejector pins don’t work so well in deep draw parts with long cores. Is there a better way? We built a customized, automatic stripping mold. Here, the core and cavity plates were pressed together against four powerful springs, temporarily held by locking plates. This assembly was then mounted into the injection molding machine, after which the locking plates were removed. After the mold opens, the springs pushes the cavity plates apart. 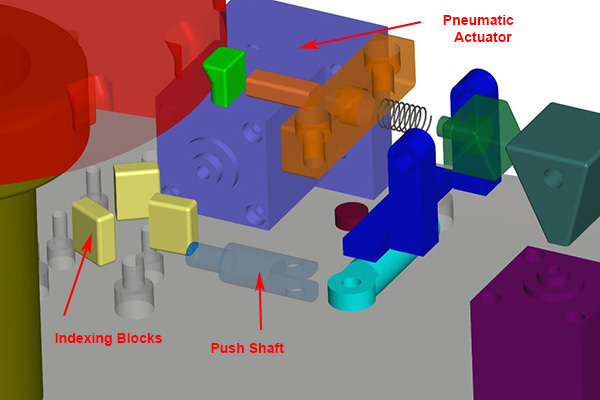 At this point, the hydraulic piston activates the slider, which in turn retracts the insert. The plastic tube is then forced off of the insert by a stripper plate, the finished part falls free, and the cycle can be repeated. No ejector pins and no witness marks. These are only a few examples of the extra effort we put into making sure your parts are made as quickly as possible and to the highest standards of efficiency and repeatability. Our research and development team will continue to create innovative and patented solutions to meet your special requirements. 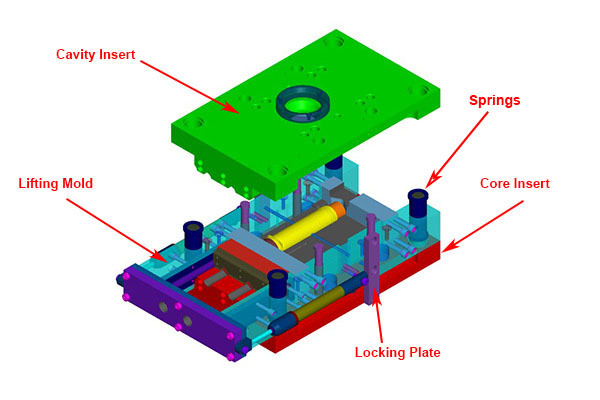 Learn more about how our CNC machining and plastic injection molding services can support your next project or upload your CAD files for a free quotation.